Dr.Malpani's Blog: Why ‘Marketing’ is no longer a dirty word for doctors ! Why ‘Marketing’ is no longer a dirty word for doctors ! This is a guest post from Mr Parag Vora, CEO of Infoseek in which I am an angel investor. In the past, most doctors used to feel that marketing was below their dignity. Medicine was considered to be a noble profession, while marketing was seen to be a sleazy way of soliciting for patients. In today’s competitive market however, , a doctor can no longer continue to retain these outdated beliefs. Every doctor needs to wake up and realise that marketing has become a necessity for survival. Look around you - the corporate hospitals have already started eating into your market share and now take away a large chunk of patients who used to come to you in the past ! Is it because they are better than you? More experienced ? Or that they provide better patient care ? I don't think so ! In fact, the care in many of these hospitals is impersonal – and very expensive ! Why do patients go there ? The answer lies in the simple fact that they are able to 'MARKET'; 'BRAND' and 'POSITION' themselves much better than you can ! Marketing is not the same as advertising ! It basically means you use techniques which influence your patient's choice in selecting his doctor, by demonstrating the true value of your expertise and services. Marketing is something doctors has always done. It’s just that in the past, it was basically simple “word of mouth marketing. In today’s age, you need to adopt the marketing methods being followed by other industries. To understand how marketing can help your medical practice, you first need to understand how a patient chooses a doctor. The quality of medical care and the expertise of the doctor is a major factor , but the truth is that it is extremely difficult for a patient to assess this , because he simply does not have the technical sophistication to be able to differentiate between a good doctor and a bad doctor ! 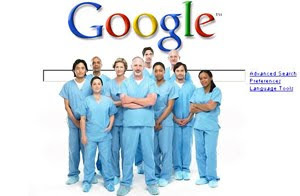 Hence , patients look at proxy measures , such asreferences from family and friends; the doctor’s “reputation”; whom the local chemist recommends; and often by doing a google search ! In my opinion, a kick-start to your marketing efforts should be focused on your current patient population. Provide them with excellent care and service and they will be the best marketeers for your practice. If you treat them well and provide them cost effective medical care, they are certainly going to recommend you to their family and friends. Your image is another very important marketing tool for you – and your clinic’s ambience plays a key role ! This could be a plus– or could be a black mark against you ! For instance - acramped waiting room with paint peeling off the walls ; a dirty consulting and examining room; ill-behaved support staff; and no information about the services that you offer. Do you think this will inspire confidence in your patient while he is waiting to see you ? Whenever I check-in to a hotel room, the first thing I see is how well maintained the washroom is. It tells me a lot about the hotel and its service , and builds up their image. Isn’t the first impression often the last? 3. A patient resource center within your clinic with patient education books and DVD’s. 4. A short AV film about your clinic; your expertise; infrastructure; with patient testimonials. Marketing yourself does not have to cost a lot of time and money . Marketing is simply letting your patients know that you are genuinely willing and able to take care of them !